One dictionary definition says that a principle is a fundamental truth or proposition that serves as the foundation for a system of belief or behavior or for a chain of reasoning. A fundamental source or basis of something. A few synonyms include truth, proposition, concept, idea, theory, assumption, fundamental, essential, and ground rule. David Hicks, in his book Norms & Nobility, talks about the reality that no method of education is free from beliefs about man; about who man is, his purposes, and his powers. Hicks is not the only one who talks about education and the underlying beliefs underlying them. 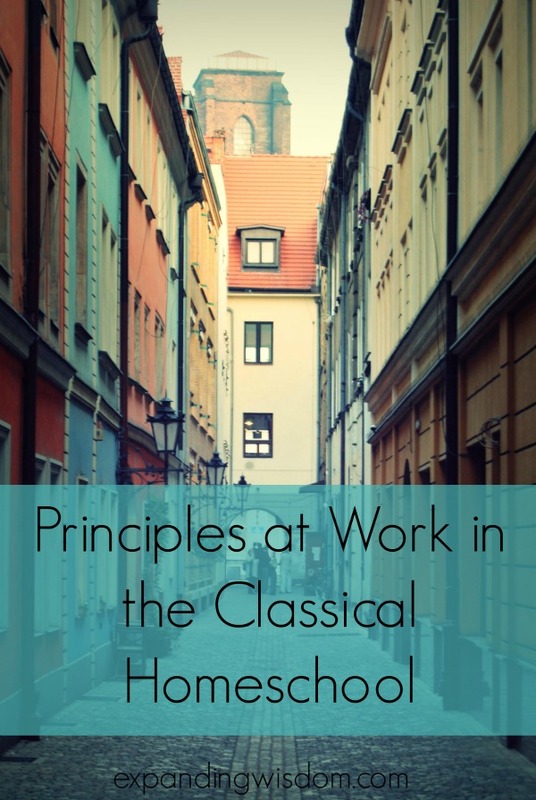 Many great thinkers have talked about numerous principles they have discovered and watched at work in a variety of situations. The principles are there. They are there for any attentive person to discover. Usually, one is faced with discovery when they are struggling with an idea, problem or situation. I was reminded of the power of pain and struggle as I listened to a podcast from the CiRCE Podcast Network about Flannery O’Conner. I can’t remember the quote verbatim, but it was something about how everything great she produced came from being sick. There was a power in the struggle that brought beauty and goodness to the surface. When we respond to our problems in repentance, thoughtfulness, and in seeking counsel, whether from others or books, it is amazing what insights are available to the average person to behold. This four-part series is about aspects of my journey of learning more about classical homeschooling and teaching and some of the principles that helped me to find more harmony in my homeschool and teaching. Much of it has been unexpected, but all of it has been good. To begin, I would like to read a quote by Wendell Berry from his work The Unsettling of America: Culture & Agriculture. How is this possible? How do we direct thought into action? How do the things we know become part of us and become our actions? I think the sentence “What is desirable is repeatedly defined in the tension of the sense of consequence” gives us a clue. We are concerned with producing something. We are concerned with what is. Not only that, but we have this new found high calling of “reconciling things in harmony.” That is good. But many times we find ourselves wanting. I know I have and do. As I have failed over and over again and turned to try and try again, eventually something would happen. The numerous failures became living types for me to learn from and eventually, after thinking about these types long enough and over time, themes or principles would begin to emerge that seemed to bring some revelation to the heart of the problem. In turn, if I responded to the points of understanding with action, harmony found its way into the situation. As I began to put these principles into practice and talk with others who were experiencing similar things, I realized the heart of the problem was not something I alone experienced but was something many of us experienced, who were trying to do this classical homeschooling thing. The following posts in this series are several situations I have faced over the last few years and some of the things I have learned from them. Many of the things I learned and discovered about myself as a homeschooling mom and teacher are common temptations we all face as we seek to make sense of practicing the classical tradition in our homeschools. As new posts publish I will link to them here.